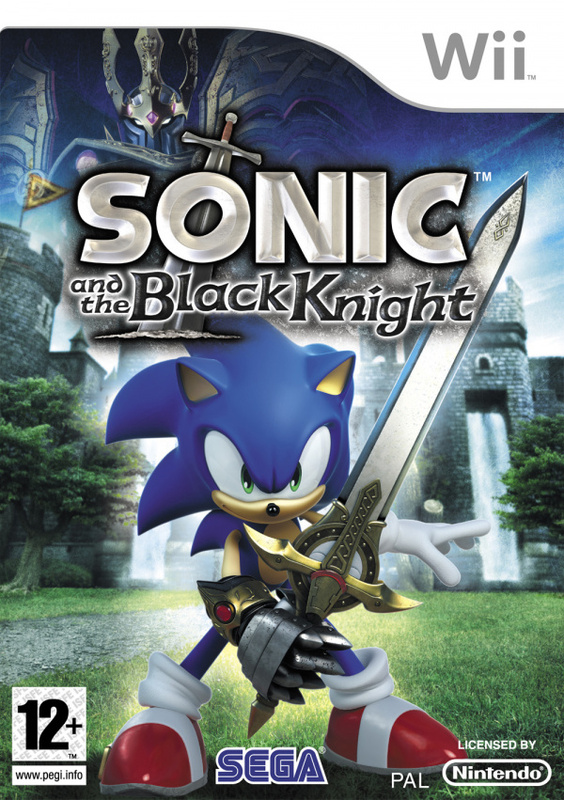 As the second game in the Storybook series, Sonic and the Black Knight (S&BK from now on) places Sonic into the legend of King Arthur, complete with the Knights of the Round Table, Excalibur and the Lady of the Lake. Like Secret Rings, each character from the story is played by a side character from the Sonic universe – Shadow is Lancelot, Knuckles plays Gawain and presumably they’d ran out of interesting characters when they cast Tails as a blacksmith. In fact, the story is almost identical to that of its predecessor – Sonic is summoned into a faraway world by a lady with magical powers to stop an evil chap who’s gained access to an all-powerful object. Of course, story isn’t everything in a Sonic game, but as part of the Storybook series it should be an interesting tale, and here the game doesn’t disappoint, putting its own blue spin on the well-known legends. After the very shiny and well-produced intro movie we’ve come to expect from Sonic games you’re thrust into the action with a brief opening level that introduces you to the control system. Unlike 2007’s Secret Rings, this time you use the Nunchuk control stick to move Sonic about and the Remote for waving the sword, a system which sounds like it should grant much more control to you than it actually does. You’re still on-rails as in its predecessor, but if anything it feels as if there’s less control because there’s a lack of branching paths and alternative routes. The paths you can take are even narrower than in Secret Rings which, coupled with a very low camera angle, makes it hard to dodge the obstacles in your path, particularly when there’s man-traps, bottomless pits, trapdoors and more. There’s more to S&BK than just dodging traps though – this is the first game Sonic has wielded a weapon, which takes the form of the talking sword (yes) Caliburn. 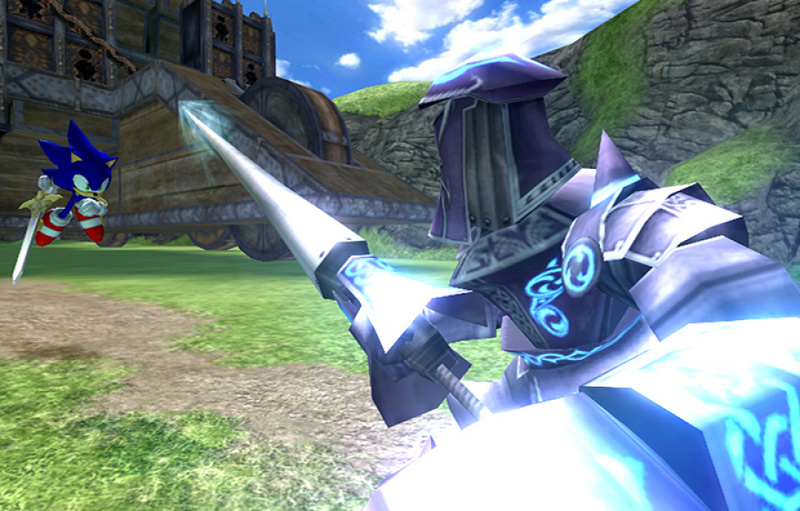 Shaking the Wii Remote results in a sword swipe, and combos are performed by swinging repeatedly, but there’s a disappointing lack of control over the sword, with no difference in attacks whether you swing up and down or left and right. There’s also an irritating delay after each swipe which means you never get the feeling of fluidity as you would with a Legend of Zelda game, and the lack of control over Sonic in the first place severely limits any feeling of strategy in the sword fights. 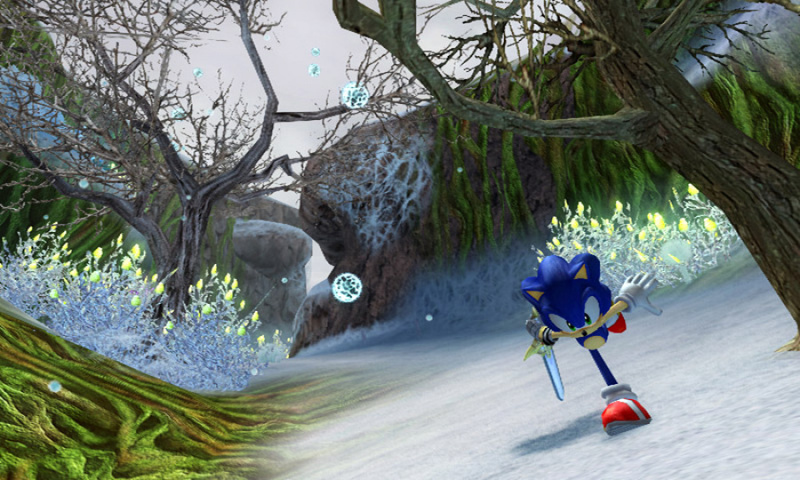 To see Sonic repeat his mistakes is disappointing – one of our criticisms of Sonic Unleashed was that the Werehog fights were so repetitive you’d simply move from one room to another defeating the same enemies, and the same is true with S&BK, where they appear in waves as you run through the levels. The presence of a homing “Soul Surge” attack is a welcome boost to the action, but can sometimes slow the game down even further as you wait for the icon to appear over each enemy. There are some high points to the swordplay, though. The opening sword fight with King Arthur lets you parry with a well-timed swing and a short set-piece on the back of a carriage, although more LucasArts than Lancelot, is great to see. The only problem is that for each good moment there’s a poor one to drag it down – a boss fight against a dragon is simply a case of moving left and right to swing at its head, and the encounters with Shadow and Knuckles feel more like fencing than swordplay due to the narrow path. With more freedom for these fights in the style of Zelda they should have been much more enjoyable, but as it stands they just don’t stand up. 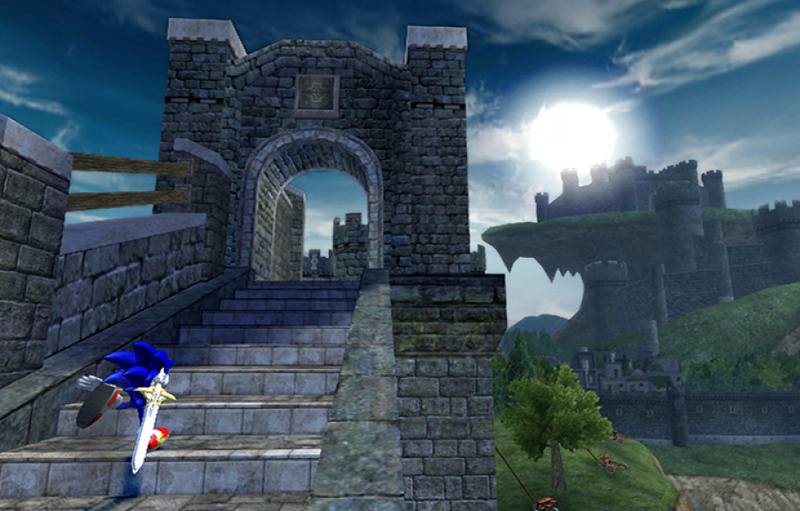 Perhaps to make up for this lack of depth, Sonic Team have introduced a number of features to extend the game’s lifespan, including a multiplayer battle mode that stands head-and-shoulders above Secret Rings’ poor party mode. There’s also the option to exchange collectible presents with friends over WiFi Connection, online rankings and a level-up system that rates you on how many followers you have, with honourable bonuses available for not harming villagers, never attacking foes from behind and so on. It’s an interesting system that never really feels as fleshed out as it should; with the camera angle and inaccuracy of the sword combined it’s sometimes tough to have the necessary precision to gain good honour bonuses, though the system’s presence is a welcome boost to its longevity for those willing to stick with it. Sonic scripts have never been great, but S&BK probably presents a new low for the series as each character attempts to talk in an English accent whilst saying phrases like “it’s kinda my fault, see?” The anachronistic dialogue and voice acting aside, the audio side of the game sticks to the well-worn template of soft rock and orchestral pieces, with composition duties spread between series stalwarts Jun Senoue, Howard Drossin and Richard Jacques, with other composers contributing too. Even with this quality talent the music never reaches the heights of the excellent Sonic Unleashed soundtrack, nor beats the variation of Secret Rings, but it does its job. Sonic and the Black Knight had alarm bells ringing from the start with its addition of a sword to the formula, which isn’t surprising considering the uproar when Shadow got his gun. It’s not a terrible idea but it has been poorly executed – without the speed and sense of adventure of a traditional Sonic game, and the sword fighting lacking enough control and strategy to be worth coming back for, there just isn’t enough here to recommend it even to the most die-hard Sonic fan. Sadly, for this die-hard Sonic fan, Sonic and the Black Knight just doesn’t cut the mustard. This review is almost exactly the way I feel about this game. 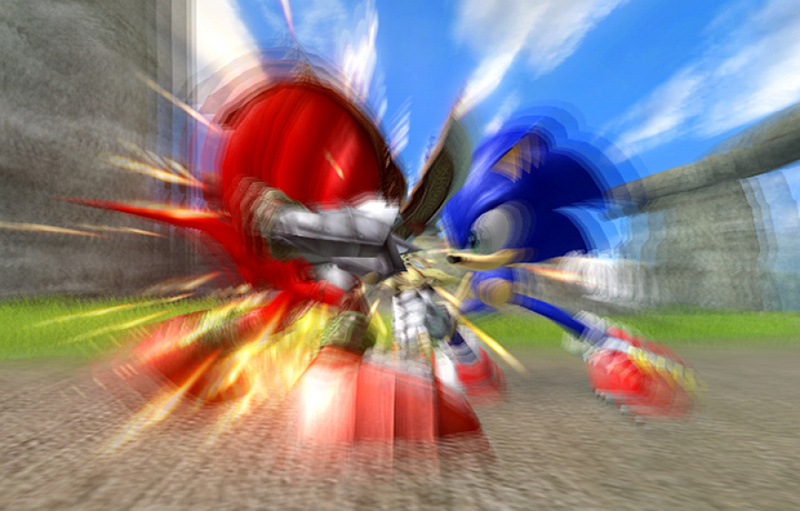 I think Sega goofed on a couple of things: one is the bosses, how there's poor timing parrying their attacks. Sonic Unleased was rather mediocre, ditto here. Enough is enough Sega, just stop making Sonic games now! I'm buying it either way, I love sonic. Even the games others have hated. I noticed you guys gave it a higher score then most gaming sites. Once again, we are left with the feeling that their time would be best served with developing a new 2d Sonic game for Wiiware. ...sigh... As an old ex-Sega guy, Soinc is dead to me. Unless Sonic Team get rid of everything other than 2D platforming, Sonic will never return to the same level as the masterpiece that is Sonic 3 & Knuckles. Shadx - I'm in the same boat as you, but I can't tell you how glad I am I didn't buy this. As for the higher score, its Metacritic at the moment is 58, so if anything I was even harsher than a lot of sites! I nearly went for a 6 but to tell the truth I didn't enjoy any of it, so a 6 seemed too high. What a shame. Well, can't say I didn't expect this score. I never really was into Sonic, even is his 2D days - I know, sinful - so these 3D incarnations are even less appealing to me. Plus, ever since reading Bernard Cornwell's Arthur Trilogy, I can never enjoy any other rendition of the story- even with hedgehogs and akidnas involved! Well thats sad, I really wanted this game to be really good. Sonic Unleased was only so decent. But Sonic games are getting better slowly like Sonic RPG and the Sonic Rush series. Maybe Sonic will return on WiiWare in Sonic the Hedgehog 4! We can at least hope. Sonic just works better in 2-D. When will Sega get that through their thick skulls. Sheesh. I think if they'd built this as a swordplay game with a different lead character, it could have turned out really well - it just doesn't work on the Secret Rings engine, which was built for speed and a very particular jump/land/stop type of gameplay. Nanaki - you're making me blush with all this flattering imitation! Arguing whether S&BK deserves a five or a seven only underlines the fact it's yet another disappointing outing for Sonic. I only found myself having fun maybe once or twice, but that was easily outstripped by the number of times I felt frustrated or lacking in control. Of course, I'm not going to claim my score is the only fair and decent score - if you've managed to enjoy yourself whilst playing it, more power to you. Sadly I just couldn't find enough quality in there to warrant a higher score. It's the best 3D Sonic in a while... which isn't saying much, but it's at least something. I loved the game at first but quickly tired of its shaky control setup. It's not unmanagable and the rush of the game generally makes up for the lack of defined control, but at times the game just feels like it slips out of your hands and the only thing you can really do is jump at the right time and shake the controller like a madman when a pile of enemies shows up. It's fun at first but doesn't last. Lots of stuff in this game for completionists though and I'm sure I'll head back for it all one day when I'm in the mood. The soundtrack is fun (for the most part), the visuals are gorgeous and the mood of the game is light-hearted. It's just a shame the gameplay wears itself out. I'm getting sick of people holding onto the whole "go back to 2D" ideology. Give it a rest already. I feel like 3-D sonic should be really easy to develope. Secret Rings pretty much nailed it, I don't get why they feel like they need to keep on adding gimmicks. I just came to see the score. I'll definitely pick this up in due time. It looks really good, IMO. The sword frustratingly slowed things down. The momentum was broken so, so much. There IS a future for Sonic in "3D" simply because the daytime levels in Unleashed were very good. The other sections of that game were poor, however. I'm a huge Sonic fan (you most likely know that by now if you know me well), so I'll most likely buy this sometime down the road. Well, this is obviously a lie. I'm a die-hard fan, and while the game took a little getting used to at first (wasn't used to on-rails), I thought it was an excellent title.